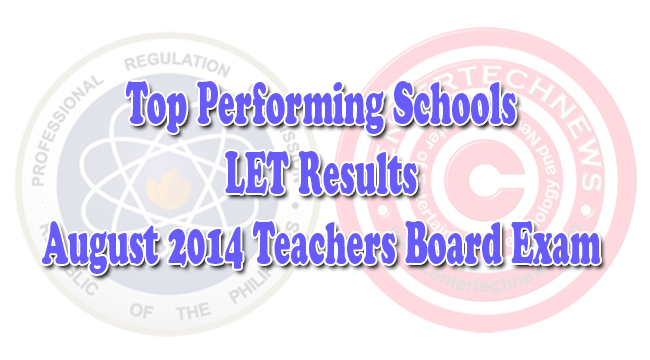 The list of Top Performing Schools for LET Teachers Board Exam Result for August 2014 is finally released. The result for the LET Results of August 2014 Teachers Board Exam was announced by the Professional Regulation Commission (PRC) after 51 days. The list of top performing schools also includes the percentage of the number passed examinees. These schools have 50 or more examinees and has atleast 80% of the passing average. As announced by PRC, out of 70,786 examinees, 25,301 elementary teachers(35.74%) had passed while 26,767 secondary teachers out of 77,803 examinees (34.40%) successfully passed the Licensure Examination for Teachers (L.E.T.) given on August 17, 2014 in Hong Kong and 24 testing centers all over the Philippines. As announced, in this year’s number of elementary level passers are the combined numbers of 21,649 first timers and 3,652 repeaters. For the secondary level teachers, 23,820 passers are listed as first timers while there are 2,947 repeaters. For elementary level, University of Santo Tomas dominated as the Top Performing School with 98.5 % of percentage passing with regards to the LET August 2014 result. As for the secondary level, with the passing percentage of 93.6% , University of the Philippines- Diliman had the top place among all collages and universities. Every year, the top performing schools are recognized according to the percentage and number of passers a school has achieved. With great pride, colleges and universities also strive to be on the top to prove their quality education. Schools also use the privilege to be on the top to gain promotion and earn respect in the field of education. PRC and CHED also monitor the performance of schools as they are evaluated with the quality of their curriculum, teaching techniques and education.